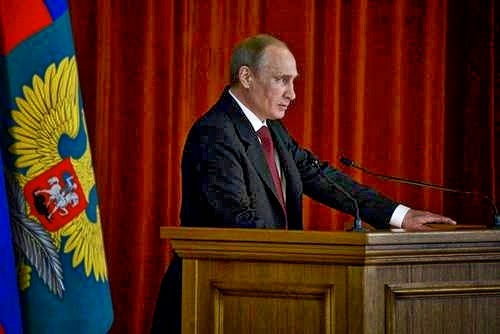 WASHINGTON, DC -- On July 1 in the Kremlin, President Vladimir Putin addressed the annual conference of Russia’s ambassadors accredited to foreign countries and international organizations, top foreign affairs ministry officials, leaders of both chambers of parliament, government ministers and agency chiefs, representatives of think-tanks and Russian business organizations. "Tsar" Putin the protector of the "Russian World". The session was dedicated to “issues of protecting Russia’s national interests,” and the most significant part of Putin’s own address dealt with Ukraine in the context of Putin’s “Russian World” (Russkiy Mir) project. Putin provided his—and Russia’s—most sweeping definition yet of population groups deemed to belong to the “Russian World” outside that country itself. By implication, Russia is entitled to protect such population groups in countries beyond Russia’s own borders. As objects of such entitlement abroad, Putin listed: [O]ur compatriots [sootechestvenniki], Russian people [russkiie lyudi], people of other ethnicities, their language, history, culture, their legitimate rights. When I say Russian people and Russian-speaking [russkoyazychnyie) citizens, I mean people who sense that they are a part of the broad Russian World, not necessarily of Russian ethnicity, but everyone who feels to be a Russian person [russkiy chelovek]. That “right to self-defense” currently translates into Russia’s paramilitary intervention in Ukraine’s east. Moscow rejects all proposals to disarm its proxy forces there, or evacuate them back to Russia, or disavow them, at least verbally. Moscow’s refusal has torpedoed Ukrainian President Petro Poroshenko’s peace plan. The plan envisaged the voluntary disarmament of those forces (in return for amnesty) and/or their safe evacuation to Russia as prerequisites to any viable political solution. By contrast, Moscow insists that Ukraine should cease fire unconditionally, accept the presence of those forces on Ukraine’s territory indefinitely and negotiate a political solution with Russia’s armed proxies. Moscow and its proxies will undoubtedly demand to keep those forces as “guarantees” to any negotiated political solution. Moscow acts as if this is an inherent right in principle and an already acquired right in Ukraine’s east. The German and French governments are siding with Moscow on this issue. Berlin and Paris have asked Kiev to prolong the ceasefire unconditionally—i.e., while pro-Russian forces dig in their heels in Ukraine’s territory—and to start negotiations with them in this situation. Unveiled on March 18 and April 17 by Putin, the Novorossiya project has failed thus far in six targeted provinces of Ukraine, but is on the march in parts of the Donetsk and Luhansk provinces, where Russia’s armed proxies hold sway. The Donetsk-Luhansk “federation” declares itself open to accession by other Ukrainian provinces. On June 26, the Donetsk-Luhansk “Novorossiya parliament” convened and elected Oleg Tsaryov as chairman. Tsaryov, a fugitive member of the Ukrainian parliament, was one of very few Russian nationalist politicians in Ukraine’s Party of Regions (which expelled him in March) and resurfaced as leader of the Kremlin-sponsored Novorossiya movement. Moscow is putting Tsaryov forward to represent, purportedly, “Ukraine’s east and south” in negotiations with Kiev and internationally. The Russian government has allowed a “liaison office of the Donetsk people’s republic in the Russian Federation” to open in Moscow; while state television channels propagate the would-be Novorossiya and its appointed representatives. Both projects, Novorossyia and “Russian World,” promote the territorial fragmentation of Ukraine and claim special rights for Russia to override Ukraine’s sovereignty. “We shall always protect the ethnic Russians in Ukraine, as well as that part of Ukraine’s population that feels inseparably linked with Russia ethnically, culturally and linguistically, that feels to be a part of the broader Russian World [Russkyi Mir]”. Putin’s statements on March 18, April 17 and June 24 on this topic invoked ethnicity and language. His latest statement on July 1, however, further enlarges the scope of Russia’s claimed rights of intrusive protection in Ukraine. This confirms that the Kremlin is unreconciled to a sovereign Ukraine. The German government seems implicitly to acknowledge this by pressing Kiev to accept Russia’s military intrusion in the country as a given, and to hold talks with “Novorossyia’s” armed leaders. The Ukrainian government has no reason to follow such advice. With most of the world opinion, against him, he could care less. He wants to take over Ukraine in the name of Russian nationalism. His kind of nationalism is destructive and has no place in the 21st century. Ukrainian Government and its military should play more active roll in removing civilian population from the ATO zone and intensify its efforts to eradicate pro-russian militants.